Limestone, granite, and marble are used in architecture and interior design to add luxury and value to a home. There are differences in the appearance and durability, so it is important to select the type of natural stone that is best suited to your style preferences, lifestyle, and application. Home design planning tools, such as our Visualizer 2D and 360° virtual rooms can be helpful when making design decisions. The most significant difference between marble and limestone is that they are two different types of rock. Marble is a type of metamorphic rock, while limestone is a sedimentary rock. Both are beautiful and have been used in architecture throughout history. Limestone is formed when the sediment, such as silt, sand, shells, and mud that settles at the bottom of lakes or oceans solidifies, forming sedimentary rock. Marble is formed when sedimentary limestone is subjected to high temperature and pressure in the natural rock forming process, causing the grains to recrystallize. Because it is formed by tiny shells, fossils, and sediment, fossilized particles can be seen in the limestone. Limestone is more porous than marble. Limestone is found in neutral colors, such as tan, browns, and greys. Limestone Onyx is formed from stalactite and stalagmite formations in caves. Limestone onyx is most often pure white, but when other minerals are present, there may be hints of pink, green, or yellow. The natural beauty of limestone makes it popular for interior design and home remodeling projects. The neutral colors make this stone flexible enough for most interior design styles and color palettes. Not only will it match your current décor, when you are ready to update the space, you can change the colors of the room without replacing the stone. The drawbacks of using limestone for interior design are similar to marble. Limestone can be stained and etched with dark colored and acidic foods and beverages. These include red wine, tomato sauce, and other acidic foods. If you want your limestone to last, it needs to be cared for properly and sealed to avoid scratching the surface of the stone. The softness and porosity of limestone means this stone may not be the ideal choice for kitchen countertops, especially for busy families and people who like to spend a lot of time in the kitchen. 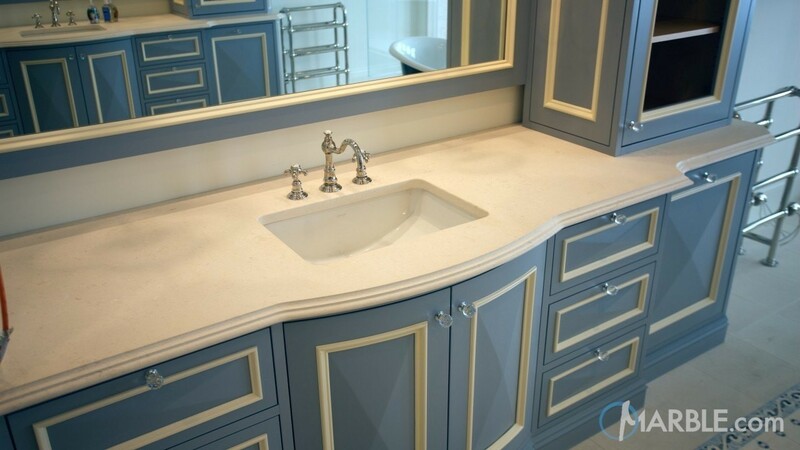 Limestone is an excellent choice for bathroom vanity tops, bathtub surrounds, shower surrounds, and fireplace surrounds. Natural stone fabricators join SlabMarket to expand their inventory with exquisite natural stone from the best quarries around the world. You can fill your container with limestone, granite and marble slabs to expand your inventory and provide the perfect limestone, marble or granite slab to satisfy the requirements of any project. Home design planning tools can help you make important decisions for your home remodeling project. Visualizer 2D and 360° virtual rooms allow you to select a room layout and make changes to various elements of the room. Open the design planner, select the room you want to use, and make changes to the kitchen countertops, bathroom vanity tops, and other elements. Try a few different combinations of colors and materials to find inspiration for your own project. If you love the natural beauty and neutral colors of limestone, you may want to feature it in your next home renovation project. Limestone is an excellent choice for low traffic areas of the home, such as bathroom vanity tops, a bathtub surround, or fireplace surround. With proper care and regular sealing, your new limestone will continue looking great for years to come.